Produced by using innovative inkjet digital printing technologies allowing for endless possibilities for variation and colour, creating profoundly accurate authentic reproductions of natural flooring materials with the durability of porcelain. A contemporary line that brings a sleek & refined urban style into your space. The innovative Division Double Loaded Porcelain Tile offers bold black tones that command a sophisticated look while providing the durability and low maintenance of porcelain. Featuring throughbody manufacturing, this line is suitable for medium-duty commercial or residential floors and walls with minimum maintenance. Polished porcelain should be sealed with an impregnating sealer. A contemporary line that brings a casual urban style into your space. The Forge Rectified Porcelain Tile offers matte grey tones that will add a sophisticated look while providing the durability and low maintenance of porcelain. Featuring coloured body manufacturing, this line is suitable for medium-duty commercial or residential floors and walls with minimum maintenance. Combine with matching 2 inchx2 inch mosaics to achieve the design that best suits your space and preferences. Add style and a functionality with this rectified and high definition porcelain. The crisp white, and cool grey tones, of the Enigma Statuario Polished Rectified Porcelain Tile will help add a contemporary look to your home at a great value! 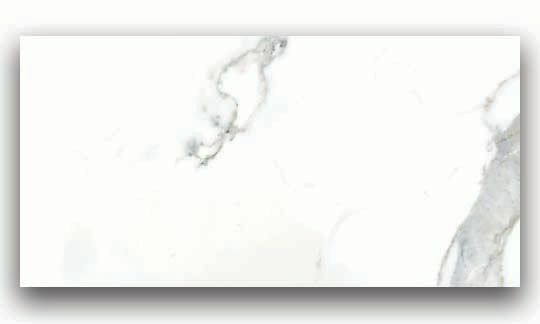 A perfect complement to any contemporary aesthetic, this elegant tile blends the look of natural stone with porcelain durability and a high-sheen polished surface to help brighten your decor. Suitable for medium-duty commercial or residential floors and walls with minimum maintenance, the tile incorporates a distinctive personal signature in a wide variety of designs. Use matching trim tile or a combination of field tile to achieve the design that best suits your space and preferences. Calacutta 12-inch x 24-inch High Definition Porcelain Tile is rated 4.0 out of 5 by 2. Rated 3 out of 5 by Stygmah from Chips really easily Hoping it doesnt once installed and grouted. But the corners kept chipping they were fine one minute and popping off the next during install. Tile is also slippery but that I guess could be expected. Looks pretty though. Nice and thick. Makes me nervous I will be redoing. What is the STC (Sound Transmission Class) rating of this product?